Growth of French token influence in the Great Lakes region. Map showing the approximate location of major tribes and settlements around 1648. The expeditions of French explorer Jacques Cartier in the 1540s made the first written records of the Native Americans in North America. French explorers and fishermen had traded in the region near the mouth of the St. Lawrence River estuary a decade before then for valuable furs. Cartier wrote of encounters with a people later classified as the St. Lawrence Iroquoians, also known as the Stadaconan or Laurentian people, who occupied several fortified villages, including Stadacona and Hochelaga. Cartier recorded an ongoing war between the Stadaconans and another tribe known as the Toudaman, who had destroyed one of their forts the previous year, resulting in 200 deaths. Wars and politics in Europe distracted French efforts at colonization in the St. Lawrence Valley until the beginning of the 17th century, when they founded Quebec in 1608. When the French returned to the area, they found the sites of both Stadacona and Hochelaga abandoned, completely destroyed by an unknown enemy. Based on analysis of political and economic conditions at the time, some anthropologists and historians have suggested that the Mohawk Nation of the Iroquois Confederacy destroyed and drove out the St. Lawrence Iroquoians. When the French returned, they found no inhabitants in this part of the upper river valley. The Iroquois and the Iroquoian-speaking Huron used it as hunting ground. The causes remain unclear. (Iroquois oral tradition, as recorded in the Jesuit Relations, speaks of a draining war between the Mohawk and an alliance of the Susquehannock and Algonquin sometime between 1580 and 1600). This was perhaps in response to the formation of the League of the Iroquois (The American Heritage Book of Indians puts this as taking place about 1570). When the French returned in 1601, the St. Lawrence Valley had already been the site of generations of blood feud-style warfare, as characterized the relations of the Iroquois with virtually all neighboring peoples. In 1603, when Samuel de Champlain visited Tadoussac near the St. Lawrence, the Montagnais, Algonquin, and Huron almost immediately recruited him and his small company of French adventurers to assist in attacking their Iroquois enemies upriver. In 1609, Algonquin, Huron, and French forces under Samuel de Champlain attacked the Iroqouis in present-day New York. Before 1603, Champlain had formed an offensive alliance against the Iroquois. He decided that the French would not trade firearms to the Iroquois. He had a commercial rationale: the northern Natives provided the French with valuable furs and the Iroquois, based in present-day New York, interfered with that trade. The first deliberate battle with the Iroquois in 1609 was fought at Champlain's initiative. Narrative makes it plain Champlain deliberately went along with a war party down Lake Champlain, and further, this battle created 150 years of mistrust that poisoned any chances that French-Iroquois alliances would be durable and long lived. Champlain wrote, "I had come with no other intention than to make war". In the company of his Huron and Algonkin allies, Champlain and his forces fought a pitched battle with the Mohawk on the shores of Lake Champlain. Champlain singlehandedly killed three chiefs with an arquebus despite the war chiefs having worn "arrowproof body armor made of plaited sticks". In 1610, Champlain and his armed French companions helped the Algonquin and the Huron defeat a large Iroquois raiding party. In 1615, Champlain joined a Huron raiding party and took part in a siege on an Iroquois town, probably among the Onondaga south of Lake Ontario (in present-day New York State). The attack ultimately failed, and Champlain was injured. After Hudson River's discovery for the Dutch East India Company in 1609, a year-round trading post was placed near Albany. At Fort Nassau the Dutch were surrounded by 1600 warriors and families of the Mahican tribe (Algonquian). The Dutch offered to buy the land off of the Mahicans but allowed traders to live among them as valued guests and in 1618 they had an agreement with the traders around. In the earlier 17th century, the great potential was yet to be discovered west towards the Great Lakes. 1617 Fort Nassau was abandoned due to flooding and in 1624 Fort Orange was built. Fort Orange renewed efforts to exploit traffic along the Mahicans Channel, and thus started war with the Mohawks. In 1626 the Dutch and the Mahicans were ambushed by Mohawks who were only armed with bows and arrows. The Dutch withdrew from the treaty with the Mahicans and made a truce with the Mohawks. The Mohawks wanted to avoid further conflict with Fort Orange. They wanted to prosper rather than destroy it. By 1628 the Mohawks defeated the Mahicans, who eventually fled to the Connecticut Valley. The Mohawks did not intend to defeat the Mahicans to open free trade; rather, they wanted to destroy Dutch trade. In 1624 the Dutch established Fort Orange in present-day Albany, New York. The fort removed the Iroquois' reliance on French traders, and their indigenous allies for European goods. In 1610-1614, the Dutch established a series of seasonal trading posts on the Hudson and Delaware rivers, including one on Castle Island at the eastern edge of Mohawk territory near present-day Albany. This gave the Iroquois direct access (through the Mohawk) to European markets. The Dutch trading efforts and eventual colonies in New Jersey and Delaware soon also established trade with the coastal Delaware nation (Lenape) and more southerly Susquehannock. The Dutch were reluctant to trade firearms to the Delaware. Their founding in 1614 of Fort Nassau and its 1624 replacement by Fort Orange (both at Albany) removed the Iroquois' need to rely on the French and their allied tribes or to have to travel through southern tribal territories to reach European traders. The Dutch supplied the Mohawk and other Iroquois with guns. In addition, the new post offered valuable tools that the Iroquois could receive in exchange for animal pelts. They began large-scale hunting for furs to satisfy demand among their peoples for new products. At this time, conflict began to grow quickly between the Iroquois and the Indigenous people supported by the French. The Iroquois inhabited the region of present-day New York south of Lake Ontario and west of the Hudson River. The Iroquois lands comprised a large ethnic island, surrounded on all sides but the south by Algonquian-speaking nations, all traditional enemies—including the Shawnee to the west in the Ohio Country. Their rivals also included the Iroquoian-speaking Neutral Nation and Huron confederacies, who lived on the western shore of Lake Ontario and southern shore of Lake Huron to the west, respectively, and the Susquehannock to their south. While part of the Iroquoian-speaking language family, these tribes historically were competitive with and sometimes enemies of the Iroquois, who at that time had Five Nations in their confederacy. In 1628 the Mohawk defeated the Mahican, pushing them east of the Hudson River and establishing a monopoly of trade with the Dutch at Fort Orange (later Albany, New York), New Netherland. In the same era, the Susquehannock, also well armed by Dutch traders, effectively reduced the strength of the Delaware and won a protracted declared war with the English-dominated Province of Maryland. By the 1630s, the Iroquois had become fully armed with European weaponry through their trade with the Dutch. Firearms from Dutch traders allowed the Iroquois to wage effective campaigns against the Algonquin, and the Huron. The Iroquois (particularly the Mohawk), had come to rely on the trade for firearms and other highly valued and much coveted European goods for their livelihood and survival. They used their growing expertise with the arquebus to good effect in their continuing wars with the Algonquin, Huron, and other traditional enemies. The French, meanwhile, outlawed the trading of firearms to their native allies, though they occasionally gave arquebuses as gifts to individuals who converted to Christianity. Although the Iroquois first attacked their traditional enemies (the Algonquins, Mahicans, Montagnais, and Hurons), the alliance of these tribes with the French quickly brought the Iroquois into fierce and bloody conflict directly with the colonists. The expansion of hunting for the fur trade with Europe accelerated the decline of the beaver population in the region. By 1640 the animal had largely disappeared from the Hudson Valley. Historian-editors of American Heritage Magazine have noted that the growing scarcity of the beaver in the lands controlled by the Iroquois in the middle 17th century accelerated the wars. The center of the fur trade shifted northward to the colder regions of present-day southern Ontario, an area controlled by the Neutral as well as by the Huron peoples, who were close trading partners of the French. 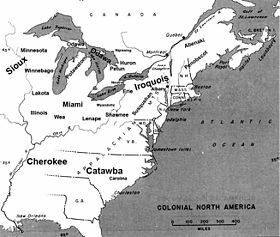 The Iroquois, displaced in that region by other nations, and threatened by their high losses to smallpox and other infectious disease, began an aggressive campaign to expand their area of control. With the decline of the beaver population, the Iroquois began to conquer their smaller neighbors. They attacked the Wenro in 1638 and took all of their territory. Survivors fled to the Hurons for refuge. The Wenro had served as a buffer between the Iroquois and the Neutral tribe and Erie allies. These two tribes were considerably larger and more powerful than the Iroquois. With expansion to the west blocked, the Iroquois turned their attention to the north. The Dutch also encouraged the Iroquois in this strategy. At that time, the Dutch were the Iroquois' primary European trading partners, with their goods passing through Dutch trading posts down the Hudson River and from there sent back to Europe. As the Iroquois' sources of furs declined, so did the income of the trading posts. In 1641, the Mohawks traveled to Trois-Rivières in New France to propose peace with the French and their allied tribes. They asked the French to set up a trading post in Iroquoia. Governor Montmagny rejected this proposal because it would imply abandonment of their Huron allies. In the early 1640s, the war began in earnest with Iroquois attacks on frontier Huron villages along the St. Lawrence River; their intent was disruption of the trade with the French. In 1645 the French called the tribes together to negotiate a treaty to end the conflict. Two Iroquois leaders, Deganaweida and Koiseaton, traveled to New France to take part in the negotiations. The French agreed to most of the Iroquois demands, granting them trading rights in New France. The next summer a fleet of eighty canoes carrying a large harvest of furs traveled through Iroquois territory to be sold in New France. When the Iroquois arrived, the French refused to purchase the furs and told the Iroquois to sell them to the Huron, who would act as a middleman. Outraged, the Iroquois resumed the war. The French decided to become directly involved in the conflict. The Huron and the Iroquois had similar access to manpower, each tribe having an estimated 25,000–30,000 members. To gain the upper hand, in 1647 the Huron and Susquehannock formed an alliance to counter Iroquois aggression. Together their warriors greatly outnumbered those of the Iroquois. The Huron tried to break the Iroquois Confederacy by negotiating separate peaces with the Onondaga and the Cayuga. When the other tribes intercepted their messengers, they put an end to the negotiations. During the summer of 1647 there were several small skirmishes between the tribes. In 1648 a more significant battle occurred when the two Algonquin tribes attempted to pass a fur convoy through an Iroquois blockade. Their attempt succeeded and they inflicted high casualties on the Iroquois. In the early 1650s the Iroquois began attacking the French themselves, although some of the Iroquois tribes, notably the Oneida and Onondaga, had peaceful relations with the French, but were under control of the Mohawk, who were the strongest tribe in the Confederation and had animosity towards the French presence. After a failed peace treaty negotiated by Chief Canaqueese, Iroquois moved north into New France along the Lake Champlain and the Richelieu River, attacking and blockading Montreal. By 1650 they controlled the area from the Virginia Colony in the south up to the St. Lawrence. In the west, the Iroquois had driven the Algonquin-speaking Shawnee out of the Ohio Country and seized control of the Illinois Country as far west as the Mississippi River. In January 1666 the French invaded the Iroquois and took the Chief Canaqueese prisoner. In September they proceeded down the Richelieu; unable to find an Iroquois army, they resorted to burning their crops and homes. Many Iroquois died from starvation in the following winter. 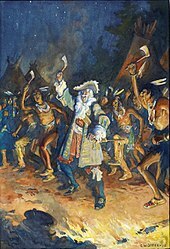 The 1701 Grande Paix (Great Peace) in Montreal was signed by 39 Indian chiefs, the French and the English. In the treaty, the Iroquois agreed to stop marauding and to allow refugees from the Great Lakes to return east. During the following years, the Iroquois strengthened their confederacy to work more closely and create an effective central leadership. Although the workings of their government remain largely unknown, by the 1660s the five Iroquois nations ceased fighting among themselves. They also easily coordinated military and economic plans among all five nations. As a result, they increased their power and achieved a level of government more advanced than the decentralized operations of the surrounding tribes. Although Indian raids were not constant, they terrified the inhabitants of New France. Initially, the colonists felt helpless to prevent them. Some of the heroes of French-Canadian folk memory are individuals who stood up to such attacks. Dollard des Ormeaux, for example, who died in May 1660 while resisting an Iroquois raiding force at the Battle of Long Sault, the confluence of the St. Lawrence and the Ottawa Rivers, succeeded in saving Montreal by his actions. In 1692, 14-year-old Marie-Madeleine Jarret (renowned as Madeleine de Verchères) successfully frustrated an Iroquois attack on Fort Verchères. In 1648, the Dutch authorized selling guns directly to the Mohawk rather than through traders, and promptly sold 400 to the Iroquois. The Confederacy sent 1,000 newly armed warriors through the woods to Huron territory. With the onset of winter, the Iroquois warriors launched a devastating attack into the heart of Huron territory, destroying several key villages, killing many warriors and taking thousands of people captive, for later adoption into the tribe. Among those killed were the Jesuit missionaries Jean Brebeuf, Charles Garnier, and Gabriel Lallemant. Each is considered a martyr of the Roman Catholic Church. The surviving Huron fled their territory to seek assistance from the Anishinaabeg Confederacy in the northern Great Lakes region. The Odaawaa Nation (Ottawa) temporarily halted Iroquois expansion further northwest. With the Hurons' withdrawal, the Iroquois controlled a fur-rich region and had no more native tribes blocking them from the French settlements in Canada. European diseases had taken their toll on the Iroquois and neighbors in the years preceding the war, however, and their populations had drastically declined. To replace lost warriors, the Iroquois worked to integrate many of their captured enemy by adoption into their own tribes. They invited Jesuits into their territory to teach those who had converted to Christianity. One priest recorded, "As far as I can divine, It is the design of the Iroquois to capture all the Huron...put the Chiefs to death...and with the rest to form one nation and country". The Jesuits also reached out to the Iroquois, many of whom converted to or added Roman Catholicism to indigenous belief. The converted Iroquois would play an important part in the years to come. In the early 1650s, the Iroquois began to attack the French. Some of the Iroquois Nations, notably the Oneida and Onondaga, had peaceful relations with the French but were under control of the Mohawk. The latter were the strongest nation in the Confederacy and were hostile to the French presence. After a failed peace treaty negotiated by Chief Canaqueese, Iroquois war parties moved north into New France along Lake Champlain and the Richelieu River. They attacked and blockaded Montreal. Typically a raid on an isolated farm or settlement consisted of a war party moving swiftly and silently through the woods, swooping down suddenly and without warning. In many cases, prisoners, especially women and children, were brought back to the Iroquois homelands and were adopted into the nations. The Iroquois attacked the Neutral Nation in 1650. By the end of 1651, they had completely driven the tribe from traditional territory, killing or assimilating thousands. At the time, the Neutrals inhabited a territory ranging from the present-day Niagara Peninsula, westward to the Grand River valley. In 1654 the Iroquois attacked the Erie, but with less success. The war between the Erie and the Iroquois lasted for two years. By 1656 the Iroquois had almost completely destroyed the Erie confederacy, whose members refused to flee to the west. The Erie territory was located on the southeastern shore of Lake Erie and was estimated to have 12,000 members in 1650. Greatly outnumbered by the tribes they had subdued, the Iroquois had been able to achieve their victories through the use of firearms purchased from the Dutch. The Iroquois continued to control the countryside of New France, raiding to the edges of the walled settlements of Quebec and Montreal. In May 1660 an Iroquois force of 160 warriors attacked Montreal and captured 17 colonists. The following year, an attack by 250 warriors yielded ten captives. In 1661 and 1662 the Iroquois made several raids against the Abenakis, who were allied with the French. The French Crown ordered a change to the governing of Canada. They put together a small military force made up of Frenchmen, Huron, and Algonquin to counter the Iroquois raids. When the militia ventured into the countryside, they were attacked by the Iroquois. Only 29 of the French survived and escaped. Five were captured and tortured to death by the Iroquois in retaliation. Despite their victory, the Iroquois also suffered a significant number of casualties. Their leaders began to consider negotiating for peace with the French. The tide of war in New France began to turn in the mid-1660s with the arrival of a small contingent of regular troops from France, the brown-uniformed Carignan-Salières Regiment—the first group of uniformed professional soldiers to enter present-day Canada. A change in administration led the New France government to authorize direct sale of arms and other military support to their Native allies. In 1664, the Dutch allies of the Iroquois lost control of the New Netherland colony to the English. In the immediate years after the Dutch defeat, European support waned for the Iroquois. In 1666, Alexandre de Prouville de Tracy led a French force of 1,300 men to attack Mohawk villages in New York. In January 1666, the French invaded the Iroquois homeland in present-day New York. The first invasion force, of 400 or 500 men, was led by Daniel de Rémy de Courcelle. His men were greatly outnumbered by the Iroquois and were forced to withdraw before any significant action could take place. Although the invasion was abortive, they took Chief Canaqueese prisoner. The second invasion force was led by the aristocrat Alexandre de Prouville, the "Marquis de Tracy" and viceroy of New France. From his base in Quebec City, as Lieutenant General of the Carignan-Salières Regiment, he initiated a campaign against the Mohawks. The invasion force of about 1300 men moved out in the fall of 1666. Upon arriving at the Mohawk villages and finding them deserted, they destroyed the villages and their crops. Prouville de Tracy seized all the Mohawk lands in the name of the king of France, and forced the Mohawks to accept the Roman Catholic faith and to adopt the French language as taught by the Jesuit missionaries. With their immediate European support cut off, the Iroquois sued for peace, to which France agreed. A map of Iroquois expansion during the war. After peace was reestablished with the French in 1666, the Iroquois returned to their westward conquest of all the land between the French, and Algonquin territory. Once peace was achieved with the French, the Iroquois returned to their westward conquest in their continued attempt to take control of all the land between the Algonquins and the French. As a result of Iroquois expansion and war with the Anishinaabeg Confederacy (see also, Council of Three Fires), eastern Nations such as the Lakota were pushed across the Mississippi onto the Great Plains. There in the early 18th century, they adopted the horse culture and nomadic lifestyle for which they later became well known. Other refugees flooded the Great Lakes area, resulting in a conflict with existing nations in the region. In the Ohio Country the Shawnee and Miami tribes were the dominant tribes. The Iroquois quickly overran Shawnee holdings in central Ohio forcing them to flee into Miami territory. The Miami were a powerful tribe and brought together a confederacy of their neighboring allies, including the Pottawatomie and the Illini confederation who inhabited modern Michigan and Illinois. The majority of the fighting was between the Anishinaabeg Confederacy and the Iroquois Confederacy. The Iroquois improved on their warfare as they continued to attack even farther from their home. War parties often traveled by canoes at night. They would sink their canoes and fill them with rocks to hold them on the river bottom. After going through the woods to a target, at the appointed time, they would quickly burst from the wood to cause the greatest panic among their enemy. After the attack, the Iroquois could return quickly to their boats and leave before any significant resistance could be put together. The lack of firearms caused the Algonquin tribes the greatest disadvantage. Despite their larger numbers, they were not centralized enough to mount a united defense and were unable to withstand the Iroquois. Several tribes ultimately moved west beyond the Mississippi River, leaving much of the Ohio Valley, southern Michigan, and southern Ontario depopulated. Several large Anishinaabe military forces, numbering in the thousands, remained to the north of Lakes Huron and Superior. They later were decisive in rolling back the Iroquois advance. From west of the Mississippi, displaced groups continued to arm war parties and attempt to retake their homelands. Beginning in the 1670s, the French began to explore and settle the Ohio and Illinois Country from the Mississippi and Ohio rivers. There they discovered the Algonquin tribes of that region were locked in warfare with the Iroquois. The French established the post of Tassinong to trade with the western tribes. The Iroquois destroyed it to retain control of the fur trade with the Europeans. During the course of this conflict, in 1670 the Iroquois also drove the Siouan-speaking Mannahoac tribe out of the northern Virginia Piedmont region. The Iroquois claimed the land by right of conquest as a hunting ground. The English acknowledged this claim in 1674 and again in 1684. They acquired the land from the Iroquois by a 1722 treaty. During a raid into the Illinois Country in 1689, the Iroquois captured numerous prisoners and destroyed a sizable Miami settlement. The Miami asked for aid from others in the Anishinaabeg Confederacy, and a large force gathered to track down the Iroquois. Using their new firearms, the Confederacy laid an ambush near modern South Bend, Indiana. They attacked and destroyed most of the Iroquois army. Although a large part of the region was left depopulated, the Iroquois were unable to establish a permanent presence. Their own tribe lacked the manpower to colonize the large area. After their setbacks and the local tribes' gaining firearms, the Iroquois' brief control over the region was lost. Many of the former inhabitants of the territory began to return. With the tribes to the north and west destroyed, the Iroquois turned their attention southward to the Iroquoian-speaking Susquehannock. 1660 marked the zenith of Iroquois military power, and they were able to use that to their advantage in the decades to follow. The Susquehannock had become allied with the English in the Maryland colony in 1661. The English had grown fearful of the Iroquois and hoped an alliance with Susquehannock would help block the northern tribes' advance on the English colonies. In 1663 the Iroquois sent an army of 800 warriors into the Susquehannock territory. They repulsed the army, but the invasion prompted the colony of Maryland to declare war on the Iroquois. By supplying Susquehannock forts with artillery, the English in Maryland changed the balance of power away from the Iroquois. The Susquehannock took the upper hand and began to invade Iroquois territory, where they caused significant damage. This warfare continued intermittently for 11 years. In 1674 the English in Maryland changed their Indian Policy and negotiated peace with the Iroquois. They terminated their alliance with the Susquehannock. In 1675 the militias of Virginia and Maryland captured and executed the chiefs of the Susquehannock, whose growing power they feared. The Iroquois made quick work of the rest of the nation. They drove the warriors from traditional territory and absorbed the survivors in 1677. As the English began to move into the former Dutch territory of upper New York State, they began to form close ties with the Iroquois. They sought to use them as a buffer and force to hinder French colonial expansion. They soon began to supply the Iroquois with firearms much as the Dutch had and encouraged them to disrupt French interests. Louis de Buade de Frontenac, the Governor General of New France, with native allies. His attempts to revive the fur-trade in the frontier led to renewed hostilities with the Iroquois. At the same time, Governor of New France Louis de Buade, Comte de Frontenac, tried to revive the western fur-trade. His efforts competed with those of the Iroquois to control the traffic and they started attacking the French again. The war lasted ten years and was as bloody as the first. In 1681 René-Robert Cavelier, Sieur de La Salle negotiated a treaty with the Miami and Illinois tribes. The same year France lifted the ban on the sale of firearms to the native tribes. Colonists quickly armed the Algonquin tribes, evening the odds between the Iroquois and their enemies. With the renewal of hostilities, the local militia of New France was stiffened after 1683 by a small force of regular French navy troops, the Compagnies Franches de la Marine. The latter were to constitute the longest-serving unit of French regular troops in New France. Over the years, the men identified with the colony. The officer corps became completely Canadian. Essentially, these forces can be considered as Canada's first standing professional armed force. Officers' commissions, both in the militia and in the Compagnies Franches, became coveted amongst the upper class of the colony. The militia together with members of the Compagnies Franches, dressed for woodland travel similarly to their Algonquin Indian allies, and grew to specialize in the swift and mobile brand of warfare termed la petite guerre. It was characterized by long expeditions through the forests and quick raids on enemy encampments—the same kind of warfare practiced by the Iroquois and other Natives. In June 1687, Governor Denonville and Pierre de Troyes set out with a well-organized force to Fort Frontenac, where they met with the 50 hereditary sachems of the Iroquois Confederacy from their Onondaga council fire. These 50 chiefs constituted the entire decision-making strata of the Iroquois. They had been lulled into meeting under a flag of truce. Denonville seized, chained, and shipped the 50 Iroquois chiefs to Marseilles, France, to be used as galley slaves. He then ravaged the land of the Seneca, including their capital of Ganondagan. Before he returned to New France, he travelled down the shore of Lake Ontario and created Fort Denonville at the site where the Niagara River meets Lake Ontario. This site was previously used by La Salle for a fort named Fort Conti from 1678 to 1679, and was later used for Fort Niagara, which still exists to this day. In September 1687, the French used 3,000 militia and regulars to attack the Mohawk Iroquois in a punitive raid on their territory. They proceeded down the Richelieu River and marched through Iroquois territory, but did not find many warriors. They burned their villages and stored crops, destroying an estimated 1.2 million bushels of corn. Many Iroquois died from starvation during the following winter. The destruction of the Seneca and Mohawk lands infuriated the Iroquois Confederacy. This, coupled with the dishonourable loss of their sachems, demanded they set out to terrorize New France as never before. Denonville's regulars were dissolved and dispersed to towns across the land, attempting to protect New France's homes and families. Forts were abandoned. The Iroquois destroyed farmsteads and whole families were slaughtered or captured. On August 4, 1689, Lachine, a small town adjacent to Montreal, was burned to the ground. Fifteen hundred Iroquois warriors had been harassing Montreal defences for many months prior. Denonville was finally exhausted and defeated. His tenure was followed by the return of Frontenac, who replaced Denonville as governor for the next nine years (1689–1698). Frontenac had been arranging a new plan of attack to mollify the effects of the Iroquois in North America and realized the true danger the imprisonment of the sachems created. He located the 13 surviving leaders, and they returned with him to New France in October 1698. The death of Major Richard Waldron during the raid on Dover. During the concurrent King William's War, the French organized raiding parties with native allies against English settlements, which had supported the Iroquois Confederacy. During King William's War (1688–1697), the French created raiding parties with native allies to attack English colonial settlements, as the English had used the Iroquois against the French. Some of the most notable of the French-sponsored raids in 1690 were the Schenectady massacre in the Province of New York; Salmon Falls, New Hampshire; and Falmouth Neck (present-day Portland, Maine). The French and their allies killed settlers in the raids and carried some back to Canada. Settlers in New England raised money to redeem their captives, but some were adopted into the Native tribes. The French government generally did not intervene when the Natives kept the captives. Throughout the 1690s the French and their allies also continued to raid deep into Iroquois, destroying Mohawk villages in 1692, and later raiding Seneca, Oneida, and Onondaga villages. The English and Iroquois banded together for operations aimed at New France, but these were largely ineffectual. The most successful incursion resulted in the 1691 Battle of La Prairie. Because France claimed dominion over the Iroquois, the French offensive was not halted by the 1697 Treaty of Ryswick that brought peace between France and England, and ended overt English participation in the conflict. Finally, in 1698, the Iroquois began to see the English as becoming a greater threat than the French. The English had begun colonizing Pennsylvania in 1681. The continued colonial growth there began to encroach on the southern border of the Iroquois territory. The French policy began to change towards the Iroquois. After nearly 50 years of warfare, they began to believe that it would be impossible to ever destroy them. They decided that befriending the Iroquois would be the easiest way to ensure their monopoly on the northern fur trade and help stop English expansion. As soon as the English heard of the treaty they immediately set about to prevent it from being agreed to. It would result in the loss of Albany's monopoly on the fur trade with the Iroquois and, without their protection, the northern flank of the English colonies would be open to French attack. Despite English interference the treaty was agreed to. A copy of the peace treaty that ended hostilities between New France and 39 First Nations. The subsequent Great Peace of Montreal was signed in 1701 in Montreal by 39 Indian chiefs and the French. In the treaty, the Iroquois agreed to stop marauding and to allow refugees from the Great Lakes to return east. The Shawnee eventually regained control of the Ohio Country and the lower Allegheny River. The Miami tribe returned to take control of modern Indiana and north-west Ohio. The Pottawatomie went to Michigan, and the Illinois tribe to Illinois. With the Dutch long removed from North America, the English had become just as powerful as the French. The Iroquois came to see that they held the balance of power between the two European powers and they used that position to their benefit for the decades to come. Their society began to quickly change as the tribes began to focus on building up a strong nation, improving their farming technology, and educating their population. The peace was lasting and it would not be until the 1720s that their territory would again be threatened by the Europeans. Also in 1701, the Iroquois nominally gave the English much of the disputed territory north of the Ohio in the Nanfan Treaty, although this transfer was not recognised by the French, who were the strongest actual presence there at the time. In that treaty, the Iroquois leadership claimed to have conquered this "Beaver Hunting Ground" 80 years previously, or in about 1621. Ceramic, lithic, shell, and European artifacts, perhaps certain faunal remains, and aspects of longhouse interments indicate the Christian site belongs to the period when Europeans, perhaps Étienne Brûlé in 1615, first entered Neutralia. As such, the identification of the intensity of foreign manifestations are important in identifying the pervasiveness of the effect of Europeans on Neutral relationships. The Illinois Country's former inhabitants returned shortly after the war ended; the Miami, Potowatomie, Sauk, and Fox tribes became dominant in the region. The Ohio Country, which was nearer to the core of Iroquois territory, remained depopulated for longer, as the Iroquois controlled it by right of conquest as a hunting ground. The Lenape settled along the Allegheny River beginning in the 1720s. It was not until the 1740s and 1750s that the Shawnee began to return to the southern and central areas of the region, and the Miami began to resettle the western portions. Through various European treaties, the English control over the Iroquois and their territory had been recognized before the war had ended. The English exaggerated the extent of Iroquois control in the west as a means to dispute French control of the Illinois and Ohio country. In 1768 several colonies officially purchased the "Iroquois claim" to the Ohio and Illinois Country. The colonies created the Indiana Land Company to hold the claim to all of the Northwest. It maintained a claim to the region using the Iroquois right of conquest until the company was dissolved by the United States Supreme Court in 1798. Because a large part of the conflict between the native tribes took place far beyond the frontier and in locations that had yet to have European contact, the full extent and impact of the war is unknown. Most knowledge of the western parts of the conflict comes through accounts of French explorers and the tribes they encountered during the early years of exploration. Even the effects in the eastern regions are not fully known, as large parts of the region remained unexplored. The resident tribes did not have direct contact with Europeans, so no accounts were passed on about the wars. The Beaver Wars joined the Powhatan wars of 1610–14, 1622–32 and 1644–46 in Virginia, the Pequot War of 1636 in Connecticut, Kieft's War of 1643 along the Hudson River, Peach Tree War, Esopus Wars, and King Philip's War in a list of uprisings and conflicts between various Native American tribes and the French, Dutch, and English colonial settlements of Canada, New York, and New England. Native American tribes would continue to be embroiled in conflicts involving England, France, and their colonists during the ensuing French and Indian Wars. ^ Morgan (1922), pp. 16-20. ^ Sultzman, Lee. "Iroquois: Beaver Wars". Iroquois History (independent). Tolatsga. Retrieved 20 July 2017. The Tahonaenrat surrendered enmass and were incorporated into the Seneca, but large groups of Neutrals and Huron fled south to the Erie. Their reception was less than cordial, but they were allowed to stay in a status of semi-slavery. The "Great Pursuit" continued, and the Iroquois demanded the Erie turn the refugees over to them. 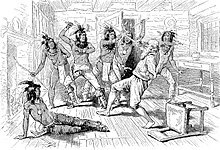 Relations between the Iroquois and Erie apparently had never been friendly, and reinforced with hundreds of new warriors, the Erie flatly refused. The matter simmered for two years with growing violence. In 1653 an Erie raid into the Iroquois homeland killed a Seneca sachem. A last minute conference was held to avoid war, but in the course of a heated argument, an Erie warrior murdered an Onondaga, and Iroquois retaliated by killing all 30 of the Erie representatives. After this, peace was impossible, and the Iroquois prepared for war. However, having great respect for the Erie as warriors, they first took the precaution of arranging a peace with the French. When the Huron were overrun in 1649, the French fur trade empire collapsed. ^ Morgan (1922), pp. 22. ^ Jennings (1984), pp. 15, 26. ^ a b Pendergast, James F. (1998). "The Confusing Identities Attributed to Stadacona and Hochelaga". Journal of Canadian Studies. 32 (4): 149–167. Retrieved 3 February 2010. ^ a b c d e f g h i j k l Brandon, William (1961). Josephy, Alvin M. (ed.). American Heritage Book of Indians. American Heritage Pub. Co. p. 187. ^ Jennings (1984), p. 42. ^ Trigger, Bruce G. (1987). The Children of Aataentsic: A History of the Huron People to 1660. Kingston and Montreal: McGill-Queen's University Press. pp. 312–315. ISBN 0-7735-0626-8. ^ Hine & Faragher (2000), p. 67. ^ a b Jennings (1984), p. 9. ^ Jennings (1984), p. 8. ^ Hine & Faragher (2000), p. 68. ^ a b Barr (2006), p. 60. ^ Barr (2006), p. 59. ^ a b Lamontagne, Léopold (1979) . "Prouville de Tracy, Alexandre de". In Brown, George Williams (ed.). Dictionary of Canadian Biography. I (1000–1700) (online ed.). University of Toronto Press. ^ Funk (1964), p. 12. ^ Barr (2006), p. 16. ^ a b Jennings (1984), p. 11. ^ Jennings (1984), pp. 12-13. ^ Barr (2006), p. 58. ^ "The Road from Detroit to the Illinois 1774.". Michigan Pioneer and History Collections. 10. p. 248. ^ Eccles, W.J. (1979) . "Brisay de Denonville, Jacques-René de". In Hayne, David (ed.). Dictionary of Canadian Biography. II (1701–1740) (online ed.). University of Toronto Press. ^ Jennings (1984), p. 23. ^ "The naming of Indiana". in.gov. Indiana Historical Bureau, State of Indiana. Archived from the original on 6 October 2008. Retrieved 2008-09-29. ^ Jennings (1984), pp. 28-29. ^ Swope, Cynthia (2004). "Chief Opechancanough of the Powhatan Confederacy". Within the Vines. ^ Wick, Steve. "Blood Flows, War Threatens: Violence escalates as a Dutch craftsman is murdered and Indians are massacred". Newsday. Archived from the original on 2008-07-09. Barr, Daniel P. (2006). Unconquered: The Iroquois League at War in Colonial America. Greenwood Publishing Group. ISBN 0-275-98466-4. Funk, Arville (1964). A Sketchbook of Indiana History. Christian Book Press. Hine, Robert V.; Faragher, John Mack (2000). The American West: A New Interpretive History. Yale University Press. ISBN 0-300-07835-8. Lupold, Harry Forrest; Haddad, Gladys (1988). Ohio's Western Reserve. Kent State University Press. ISBN 0-87338-372-9. Jennings, Francis (1984). The Ambiguous Iroquois Empire. W. W. Norton & Company. ISBN 0-393-01719-2. Salvucci, Claudio R.; Schiavo, Jr., Anthony P. (2003). Iroquois Wars II: Excerpts from the Jesuit Relations and Other Primary Sources. Bristol, Pennsylvania: Evolution Publishing. ISBN 1-889758-34-5. Schiavo, Jr., Anthony P.; Salvucci, Claudio R. (2003). Iroquois Wars I: Excerpts from the Jesuit Relations and Primary Sources 1535-1650. Bristol, Pennsylvania: Evolution Publishing. ISBN 1-889758-37-X. Thompson, Maurice (1898). Stories of Indiana. New York, Cincinnati, Chicago: American Book Company. Wallace, Paul A. W. (2007) . Indians in Pennsylvania (2nd ed.). Pennsylvania Historical and Museum Commission; DIANE Publishing Inc. ISBN 0-89271-017-9. Brandao, Jose Antonio; Starna, William A. (2004). "From the Mohawk—Mahican War to the Beaver Wars: Questioning the Pattern". Ethnohistory. 51 (4): 725–750. Hauptman, Laurence M. (1986). The Iroquois Struggle for Survival: World War II to Red Power. Syracuse, New York: Syracuse University Press. Jennings, Francis (1984). The Ambiguous Iroquois Empire: The Covenant Chain Confederation of Indian Tribes with English Colonies from Its Beginnings to the Lancaster Treaty of 1744. New York: Norton. Morgan, Lewis H. (1922). League of the Iroquois. Classic Textbooks. ISBN 1404751602.